* Powerful Trades unions causing wage inflation and time lost to strikes. * High levels of government debt that required politically sensitive borrowing from the IMF. On coming to power in 1979, Mrs Thatcher lost no time in seeking to make a clean break with the past. Mrs Thatcher was heavily influenced by the idea of Monetarism and free market economics. In addition, she wished to “destroy” the power of the “Socialist / Communist” trades unions. On coming to power, the first policies of the Conservative administration were to tackle both inflation and the budget deficit. The belief of Monetarism was that to control inflation you needed to control the money supply. To control the money supply, it was necessary to reduce any government deficit. Therefore, extreme deflationary policies were implemented. Firstly taxes were raised and government spending cut. Interest rates were also increased, as the government sought to reduce inflation. These deflationary fiscal and monetary policies did have the effect of reducing inflation; however it was at a cost of falling Aggregate Demand and lower economic growth. In the middle of 1980 the economy had been plunged into full scale recession, but the government still pursued its deflationary policies. With criticism mounting, even from her own party, Mrs Thatcher was under pressure to change course (a little like Edward Heath had in the early 1970s) However, in a now famous speech at the 1980 Conservative party conference, Mrs Thatcher stood up and defiantly said. ”You turn if you want to, but this lady is not for turning.”(2) It encapsulated her stubbornness and resolve. Fiscal policy and monetary policy remained tight, and unemployment remained close to 3 million until 1986. 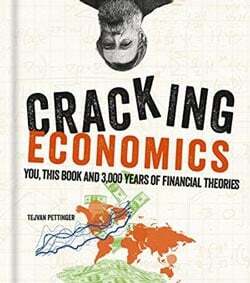 The deflationary fiscal and monetary policies were exacerbated by 2 factors. Firstly in the late 1970s and 1980s sterling became an important petro currency; with the production of oil in the north sea, the Pound Sterling rose rapidly. Combined with rising interest rates, sterling appreciated from £1 to $1.5 to $2.5 in 1980. This appreciation in the pound adversely affected Britain’s exports and manufacturing sector. 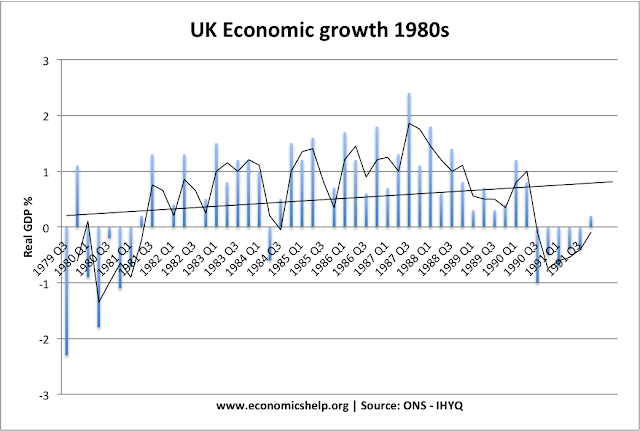 It was in manufacturing, that the UK suffered the worst effects of the 1980-81 recession. Secondly, controlling the money supply proved to be much more difficult than theory predicted. Despite rising interest rates and falling AD, growth in the money supply remained stubbornly high. This encouraged the government to maintain a tight fiscal and monetary policy. Inflation fell but the money supply didn’t; the link between money supply and inflation proved to be very tenuous, but by trying to reduce the money supply they reduced AD by more than was necessary. On the one hand, inflation was reduced, but arguably it could have been done with much less pain. In seeking to meet spurious money supply targets they caused an unprecedented level of unemployment. This unemployment caused not only personal loss but widespread social problems. 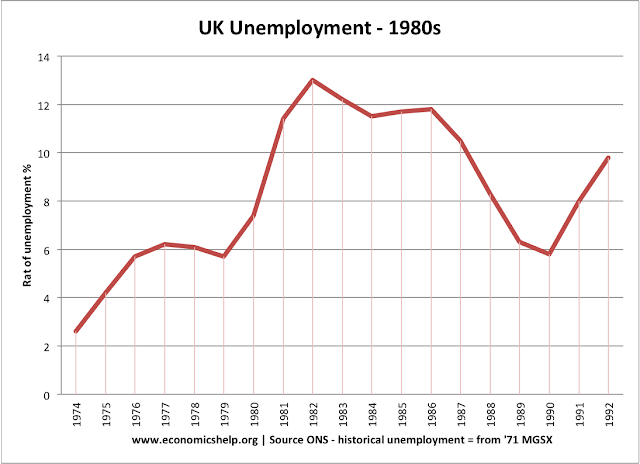 The mass unemployment, associated with inner cities, was very closely responsible for the riots which sparked across Britain in 1981. Public anger at the Conservative economic record was to a large extent mollified by the patriotic success of the Falklands War. Riding on the back of a successful military victory, and a Labour party hopelessly divided, Mrs Thatcher was returned to power in 1983; ready for her next challenge - to take on the miners. pretty fair and balance account. "Firstly in the early 1980s sterling became an important petro currency; with the production of oil in the north sea. The £ rose rapidly. Combined with rising interest rates, sterling appreciated from £1 to $1.5 to $2.5." The £ actuallly dropped from $2.5 to $1 in the early 1980s!!! 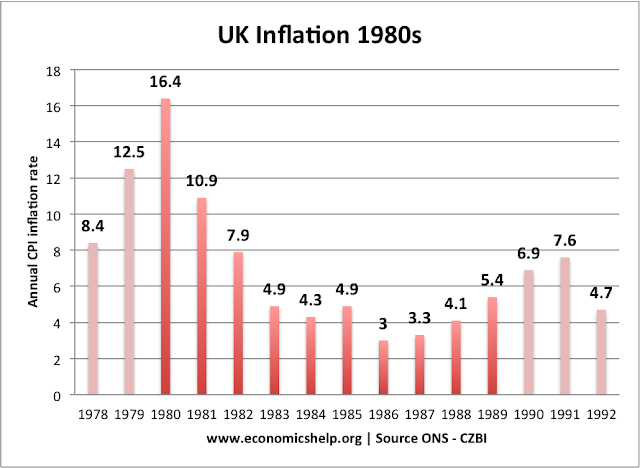 Inflation was 10% when the Thatcher government took office. The figure of 27% is for August 1975. Other than that, this is a fair and accurate essay. The Pound appreciated between 1978-1980. peaking at just under £1 to $2.5. 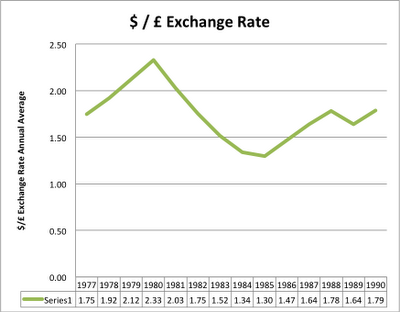 (the graph includes the annual average of the exchange rate. After 1981, the Pound fell, but by then the recession was very deep. 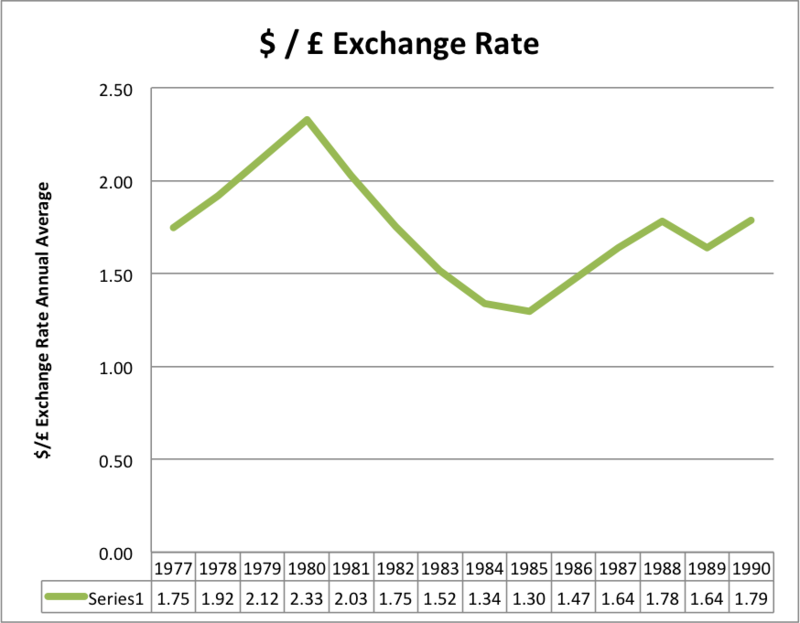 I think the strength of the Pound in 1979 and 1980 was an important factor in harming exporters. "The lady is not for turning" not "This lady is not for turning". Get it right. And you get it right! "The lady's not for turning", not "is" - otherwise the execrable pun doesn't work.